ATP-dependent recombinant T4 DNA ligase for efficient ligation of cohesive and or blunt end DNA fragments in 5 and 15 minutes respectively. 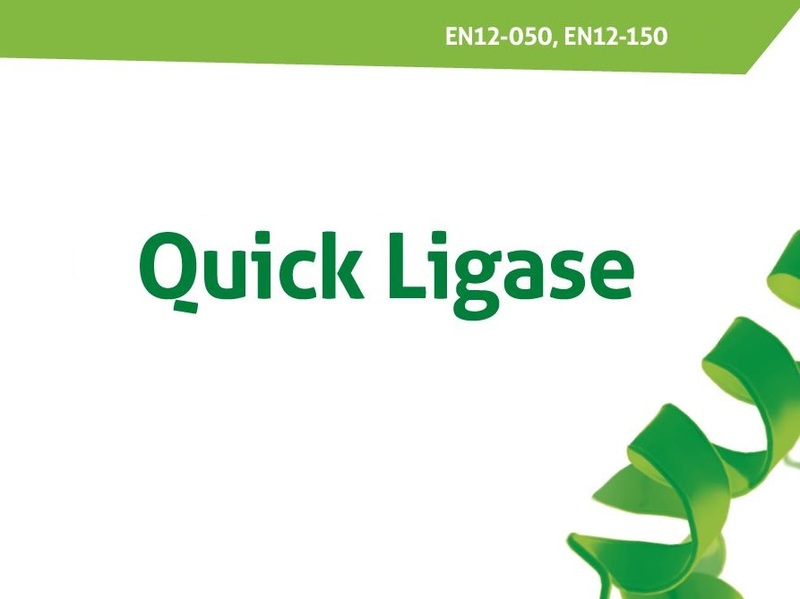 Quick Ligase is an ATP-dependent recombinant enzyme isolated from Escherichia coli strain and used to clone DNA in just 5 to 15 minutes. Quick Ligase catalyzes the formation of a phosphodiester bond between juxtaposed 5′-phosphate and 3′-hydroxyl termini in duplex DNA or RNA. It will join both blunt-ended and cohesive-ended restriction fragments of DNA, as well as repair single-stranded nicks in duplex DNA, RNA or DNA/RNA hybrids. One (Weiss) unit of Quick Ligase catalyzes the conversion of 1 nmol of 32P from pyrophosphate into Norit-adsorbable material in 20 minutes at 37°C. The 10x Ligation Buffer and ATP Solution should be thawed and resuspended at room temperature. For blunt-end ligations, use higher quantities of both the vector and the insert DNA. For sticky (cohesive)-end ligations, we recommend heating both the vector and the insert DNA prior to ligation. The enzyme is inhibited by >200 mM NaCl or KCl concentrations. Inactivate enzyme at 65°C for 10 minutes or at 70°C for 5 minutes. The product was tested in ligation of HindIII-cut lambda DNA with a different amounts of enzyme. The product is free of unspecific DNA nucleases.